Good day, everyone and welcome to Leisure Lane. 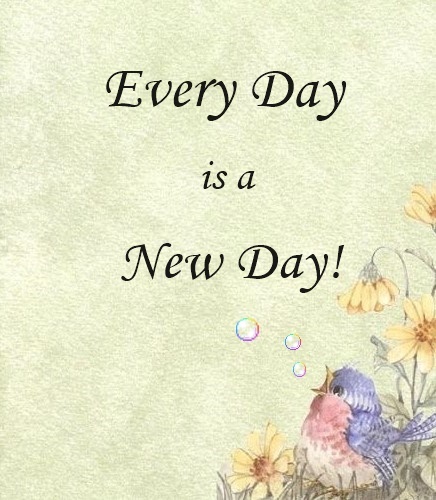 I hope you are enjoying a wonderful New Day! Back in mid-January I wrote a little song that came to me as I sat down to breakfast. Well, as you can imagine, breakfast had to wait a bit while I wrote it down. I’d like to share it with you in hopes you, too, can experience a new day any time of the day when we count our blessings. It seems to put things into perspective, giving us a new lease on life. Enjoy the poem/song and your new day, and many blessings to you. Every day is a chance at Life. To put behind you all your worries and strife. Every day is chance in the now. To acquaint yourself with all of the WOW.